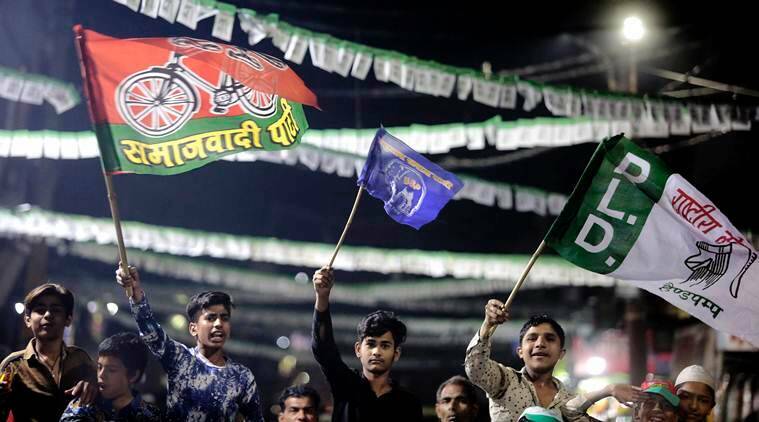 To demonstrate the gathbandhan’s unity, leaders of the three parties have made it mandatory that two workers from each party will travel in any vehicle on the campaign trail in western Uttar Pradesh that goes to polls in the first phase on April 11. The cavalcade of SUVs came to a stop in the cramped lane in Muzaffarnagar’s Kidwai Nagar. The men who jumped out raised slogans as they worked their way through a crowd to a small makeshift stage. This was the way it’s always been in election campaigns here. What was different this time is that the slogans the men raised were ragged — in praise of several parties and leaders at the same time — and very few in the crowd seemed to know which one to take up for the chorus. In the end, they just clapped. 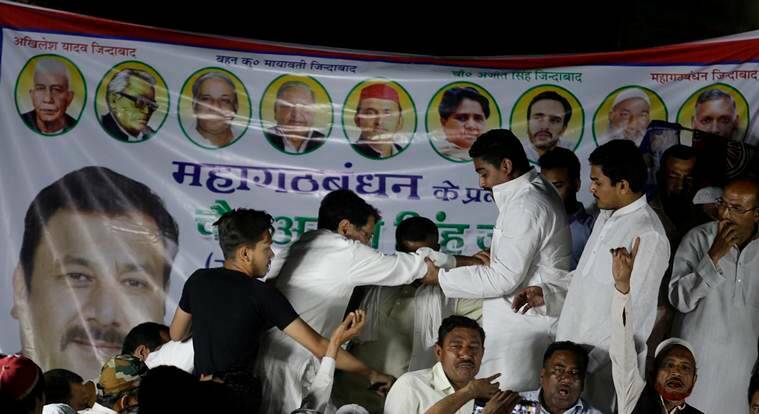 The gathbandhan may have tasted success in the Kairana bypoll last year when their alliance defeated the BJP, but leaders admit that keeping party workers in line is among the top priorities for local party functionaries. However, while the gathbandhan has managed, largely, to bring the cadre together, the last few days have seen voters demanding an answer to a new question: Will the gathbandhan last beyond the Lok Sabha election? And will the alliance fight together in the UP Assembly elections in 2022? In the eight western UP seats in the first phase, candidates from all three parties will represent the gathbandhan. “In each seat, a committee has been constituted for efficient coordination. This committee has four experienced leaders from each party, and they meet every day at 8 am to plan the campaign,” Singh said. The coordination continues in separate WhatsApp groups of leaders at the state, district, and block levels; representatives from each party deliver speeches at all rallies; and flags and symbols of all three parties are mandatory at the gathbandhan’s election office and public meetings. Nadeem Ansari, a former president of the SP’s Saharanpur city unit, was tasked with coordination on Tuesday, when The Sunday Express visited. He sat with a register at gathbandhan candidate Fazlur Rahman’s election office on Ambala Marg, and spoke constantly on the phone. “I get minute-to-minute updates about the candidate’s whereabouts while he is campaigning. My job today is to ensure party workers arrive at meetings at least 30 minutes before the candidate. There are cadres from three parties involved,” he said. The office was decorated with banners of green, blue, and red, the colours of the three parties. Stickers and posters of the three leaders, Mayawati, Akhilesh Yadav, and Ajit Singh — stitched together with computer software — covered walls and pillars. According to S Alam, the BSP media in-charge in Saharanpur, meetings were held at all levels before the workers settled down to working together. “The cadre were only used to slamming each other but now have to work together and also convince the electorate. They could never have convinced the voter if they were themselves not on board first. There were initial problems, but the victory in Kairana showed the way,” he said. More than 100 km away in Bijnore, SP district president Anil Yadav said each constituency has been allowed to use “what works”. So, “In Muzaffarnagar or Kairana, maybe one system will work. That may not be possible in Bijnore. There are different methods. Here, the candidate is from the BSP, but an SP leader heads the campaign management committee,” he said. With just over 10 days to go before polling on April 11, the gathbandhan may have brought its workers together, but leaders admitted canvassing for votes over the last few days had thrown up some worries. At the Saharanpur election office, a BSP leader said people asked him if the gathbandhan would last beyond the Lok Sabha elections, and that he had no immediate answer. “UP can have only one chief minister. And considering both Akhilesh Yadav and Behenji (BSP chief Mayawati) have held that post, they will not share power,” he said. Another worker said he had been asked the same questions, and added that some even asked if the BSP and SP would part ways after the LS polls. A third worker nodded and said such concerns had left the voters confused.